When my friend Debbie told me she was coming to San Francisco on a business trip, I encouraged her to add a day or two to play in my favorite city. After living here two and a half years, I can say with confidence that San Francisco is my favorite city, because apart from the people I love most, this amazing city boasts water on three sides, and I can’t get enough of it – the ocean, the entrance to the bay, the bay itself. It rained a bit during Debbie’s visit, just to add to the atmosphere, but that’s okay. As I noted above, I can’t really complain about too much water. Our first stop was a top tourist attraction here – a visit with my grandson and his parents. Then we did a drive-by tour of the Lower Haight and the Upper Haight, also known as Haight-Ashbury, where I visit for about three hours every month when I meander through the neighborhood to see the sights. And to buy more tie dye, of course. Next, Debbie and I headed to Cole Valley for dinner at Bambino’s, where we ordered the delectable Il Sol pizza, a chopped salad and a glass of wine each. I told Debbie that whenever I am out with Susan, my friend and my daughter-in-law’s mother, I always want to drive to the ocean after dinner, just because we can. Susan always laughs and talks me out of it. Now I know why. Debbie and I did drive to the edge of the continent, and we could see absolutely nothing. Still, a highlight of the trip was a Drive Through the Park in the Dark, which is one of Susan’s special tours for out-of-town company. As we drove along, Debbie and I laughed a lot about the futility of that venture as well. In spite of some marine mist the next morning, we drove to the top of Twin Peaks to enjoy the panoramic view. Then it was off to Peet’s to buy some fresh-ground coffee for Bill, a cup of Fair Trade for Debbie and a decaf, low-fat latte with sugar-free vanilla for me. I know my beverage of choice has nothing real in it, but I like it. I would have liked it even better had the lid not sailed off, causing the latte to christen the car, my jacket and some of Debbie’s clothing as well. We pulled over, mopped up and then headed north, over the Golden Gate Bridge. If you read the last blog, about Carolyn’s visit here, you know what happened next. I take everyone who visits to Bolinas, which requires driving north on the wonderful Highway 1. 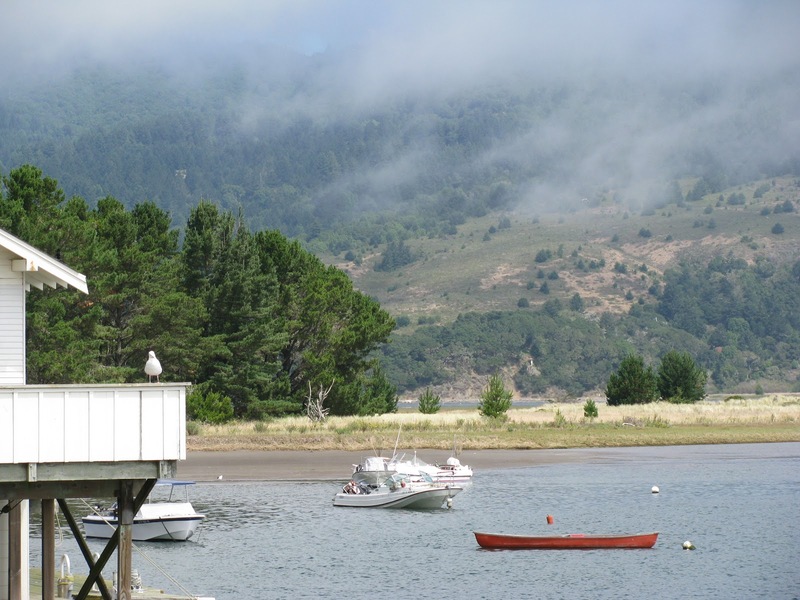 (I am crazy about Bolinas!) We stopped at the Muir Beach Overlook and then cruised through Stinson Beach, where my friend Emmeline soon will open her new gallery (see www.emmelinecraig.com/the-blissful-gallery/). We drove around the placid Bolinas Lagoon and I got to surprise Debbie with the news that the calm waters rest atop the San Andreas Fault. Then we arrived in Bolinas itself. What good fortune – a world crafts show was in progress in the community center, so Debbie and I browsed the booths. We visited with a potter who makes plates and bowls decorated with ginkgo leaves, a woman who paints other sorts of leaves on beautiful silk scarves and a jewelry maker who sported a short buzz cut with purple and black leopard spots in her short hair. Her daughter did it – and we all laughed about how much fun her look was. Our next stop was the Coast Café, where we celebrated Debbie’s birthday a bit early with blackberry pie, fish tacos and fish and chips – served in that order. Then we visited Emmeline at her art studio (see www.emmelinecraig.com). Debbie bought herself a gift, a wonderful giclee print of a laurel tree in Emmeline’s garden that she calls the Green Giant. The rain was more insistent at this point, so we drove, rather than walked, down to the beach for a quick look at rolling surf and idle sea gulls. Then we headed for San Francisco, driving past the rolling hills, the open grassland and then the stately coastal redwoods in Samuel P. Taylor State Park. For dinner, we stopped at Cliff House, close to Land’s End in the Outer Richmond, just in time to see the ocean before darkness obscured all but the sound. I showed Debbie the location of the old Sutro Baths (http://en.wikipedia.org/wiki/Sutro_Baths) and we headed to the bar at the Cliff House, where a mannequin stands attired in an old-time bathing suit. (My Full Moon Cocktail companions are on a first-name basis with him, though he never asks our names.) We feasted on crab cakes, spicy shrimp and garlic-truffle fries. Oh, and pear martinis, a delicious silken concoction that I dream about from time to time. In any case, we had a great visit – and no doubt my freezer will be full of treats next time Debbie visits! Bill – you are invited too!